Entelechy 2012 for piano and electronic modification is a meta-composition, that is, a composition whose performances are “versions” that may vary from family resemblance to considerable difference. While all notated, fixed compositions are subject to various performance practices and interpretations, a meta-composition is a more abstract musical entity where what is notated can be realized or interpreted in different ways each time it is performed. In the case of Entelechy 2012, the pianist reads a graphic score, which may be started or ended at twenty-four specific moments in the score. The piano’s sound is modified by a laptop computer program so that the sonic result is a succession of timbreally unique gestures often including microtones, vibrati and glissandi—categories of sound impossible to produce on acoustic keyboard instruments. These altered sounds are sent out of the laptop computer to a stereo loudspeaker system in the concert space in which they appear to move around in space at apparent distances. 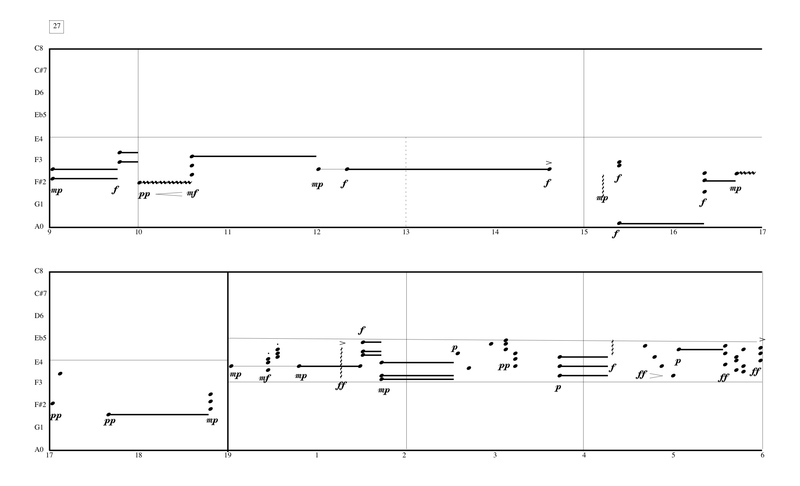 The succession of sound transformations are related to the structures found in the score, and, like the score, may be started at different time-points in the computer on each performance. Thus the score and the computer transformation act together at different temporal intersections, making each performance unique. This composition is an advance on two of my earlier similar live-electronic compositions. Entelechy (1969) for voice, cello and piano and Entelechy ’77 (1977) for electronic piano. Unlike its predecessors Entelechy 2012 has a underlying structure based on a ring of 24 elements that include all the permutations of four elements once each. This ring guides the timbres, gestures, and pacing of the piece. However it does not produce a sense of stability or unity in any of the performances. Rather the composition is designed to be radically impermanent, providing surprising and novel experiences as it moves on, as much as in jerks or surges as ebbs and flows. The word “entelechy” was coined by Aristotle to refer to the condition of a thing whose essence is fully realized, implying an actuality that directly stems from some potential idea or concept. Accordingly, the score and sound processing software program provide the essence of the composition, which is realized differently in each performance.